Thanks Rachel from Rachel’s Rocks Canada for sharing this with us! 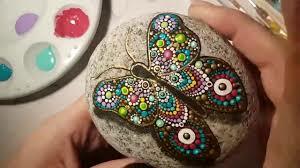 Painting butterflies on stone is becoming quite popular, you can find them all over pinterest and on other blogs. Take your hand to the paint and see what you can come up with! You can buy Rachel’s Rocks on Etsy, and Follow Rachel’s Rocks on Youtube or Facebook.